We all struggle to get through the challenges of the day when we haven’t had plenty of rest the night before. Unfortunately, if your bed just isn’t doing the trick comfort-wise, and you don’t want to buy a new mattress just yet, you may feel as though good sleep is nothing but a pipe dream. The best mattress topper could be all you need to transform your restless nights into moments of comfort and relaxation. The right mattress topper doesn’t just provide added comfort; it also helps to protect your mattress from dust mites and stains, ensuring that your entire bed lasts longer too! Whether you’re looking for a firm mattress topper, or something squishier, the right product will improve your evenings drastically. The question is, which one is right for you? 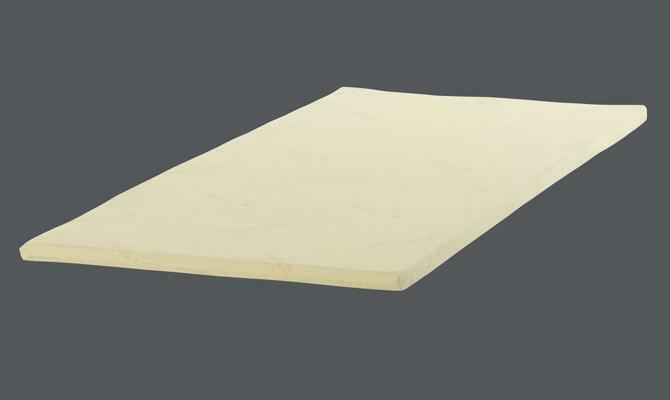 Memory foam is probably one of the most popular materials for a good mattress topper. This unique material cushions and supports your body, moulding to the shape that’s right for you. Memory foam bed toppers allow you to enjoy all the benefits of memory foam, without forking out excessive cash for a brand-new mattress. This mattress topper is both supportive and soft at the same time. If you’re sleeping with a partner and you both prefer a different level of firmness from your mattress, it should be a good choice. What’s more, you won’t have to worry about an overly “chemical” smell which can be an issue for some memory foam products. For sensitive sleepers, the Eve topper is also hypoallergenic, and it comes with free delivery, and a 30-day trial and return option. If you change your mind about it being the best memory foam mattress topper, you’re not locked into keeping the product just because you’ve already used it. Probably one of the most high-tech bedding accessories on the market, this cool mattress topper comes with “5 zones of OctaSpring foam”. That means that the topper stays soft and bouncy, no matter how much you use it. The OctaSpring zones in the Dormeo topper also offer different levels of firmness throughout specific portions, intended to give you more support where your body might place more weight on the bed. It’s great for couples because the foam absorbs the movement. That means that you’re not going to wake your partner if you’re a restless sleeper. Additionally, the OctaSpring Body Zone topper is also incredibly breathable, which means that if you’re generally a “hot” sleeper, you won’t find yourself waking up covered in sweat too often. At a relatively low price, this is a great mattress topper from the memory foam segment. Sometimes, when you’re looking for something to enhance your sleeping patterns, you only need the slightest alteration. For hot sleepers, thick mattress toppers can sometimes present a problem, because they frequently absorb and maintain heat. On the other hand, the Silentnight Impress memory foam topper is designed to give you the comfort you need with only 2.5cms of foam. This is an ideal option for people who don’t want to add too much extra depth to their mattress. The 2.5cms of foam is still enough to mould well to your body shape and give you the additional support you need around your spine and joints. Additionally, the hypoallergenic cover is excellent for people who are sensitive to dust and other contaminants. The removable cover is washable at 40 degrees, so you don’t have to worry about taking it to a specialist, and you can rest assured that your thin Silentnight topper won’t leave you feeling swaddled during the hotter, summer nights. If you’re looking for a mattress topper that’s thick enough to transform your entire mattress, then this could be the one for you. The Homescapes goose feather extra thick mattress topper is a luxurious sleeping experience, measuring at 7 centimetres in depth. Don’t worry; the cotton covering does help to keep you protected from any itchy feathers. The Homescapes extra thick topper is one of the best products around for people who prefer a soft mattress. The caged feathers within help to lull you to a night of wonderful sleep, without simply sinking within a few days of usage. If you notice that your topper is starting to flatten in certain areas, all you need to do is shake it out. Unlike some other bed toppers on the market, the Homescapes option also comes with elasticated straps on the corners to keep it locked in place so that you don’t have to worry about it shifting during the night. Pandas always seem to love sleeping, so why not take a leaf out of their book? The Panda Memory Foam mattress topper is an all-natural product, perfect for people with sensitive skin. 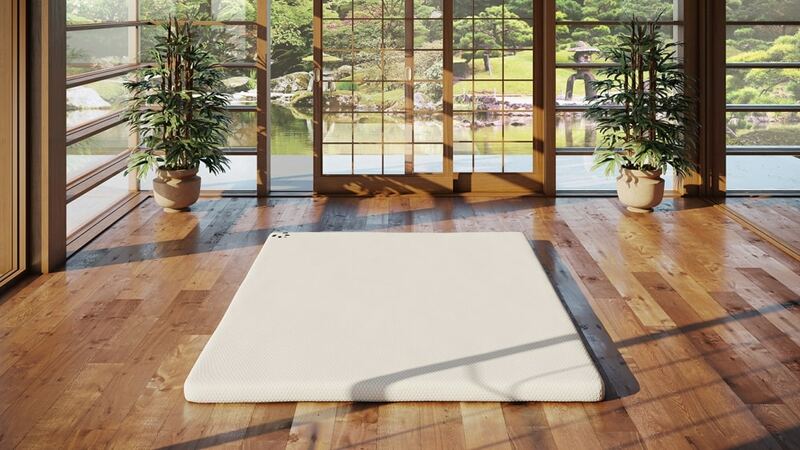 The Bamboo mattress topper includes a naturally hypoallergenic cover, which you can remove and wash at your leisure. Perhaps the most appealing feature of this topper is that it’s one of the best mattress topper for bad back products on the market. 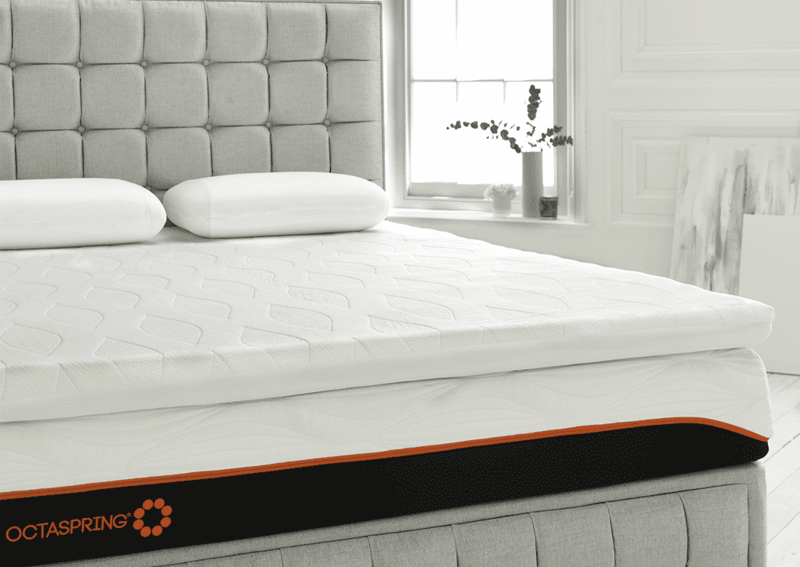 The foam is designed with an extra layer of orthopaedic support, to keep your spine comfortably aligned while you sleep. What’s more, the “hydro foam” filling also comes with capsules of cooling gel throughout – ideal for hot sleepers. The Panda Memory Foam topper comes with an anti-slip layer to make sure it doesn’t move around on your bed during the night, and there are also elastic straps at each corner for extra resilience. You shouldn’t have a hard time getting a great night’s sleep on this topper. 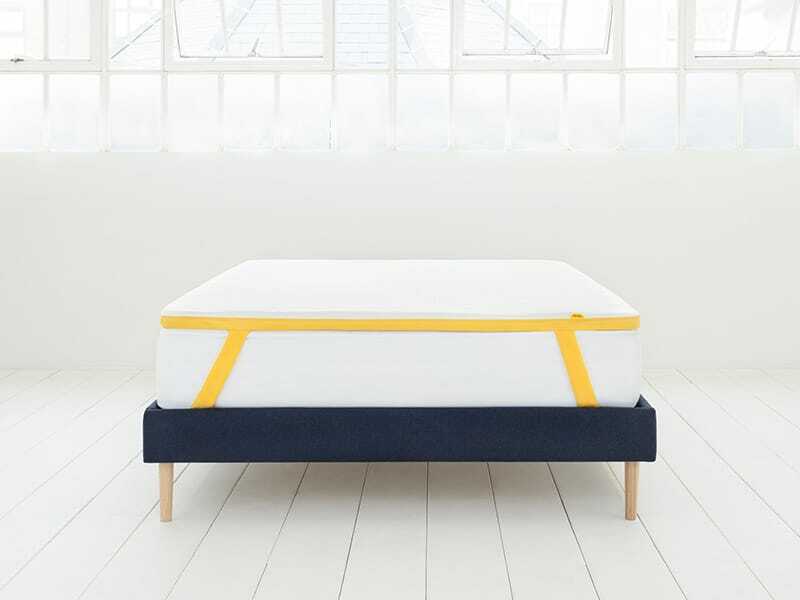 TEMPUR is a popular name in the mattress industry, but did you know the brand has also branched out into the bed toppers space too? With TEMPUR mattresses, you can choose the thickness that’s right for you depending on your sleeping habits. The TEMPUR 7 is one of the most luxurious firm mattress topper options on the market, with 7 centimetres of memory foam support. 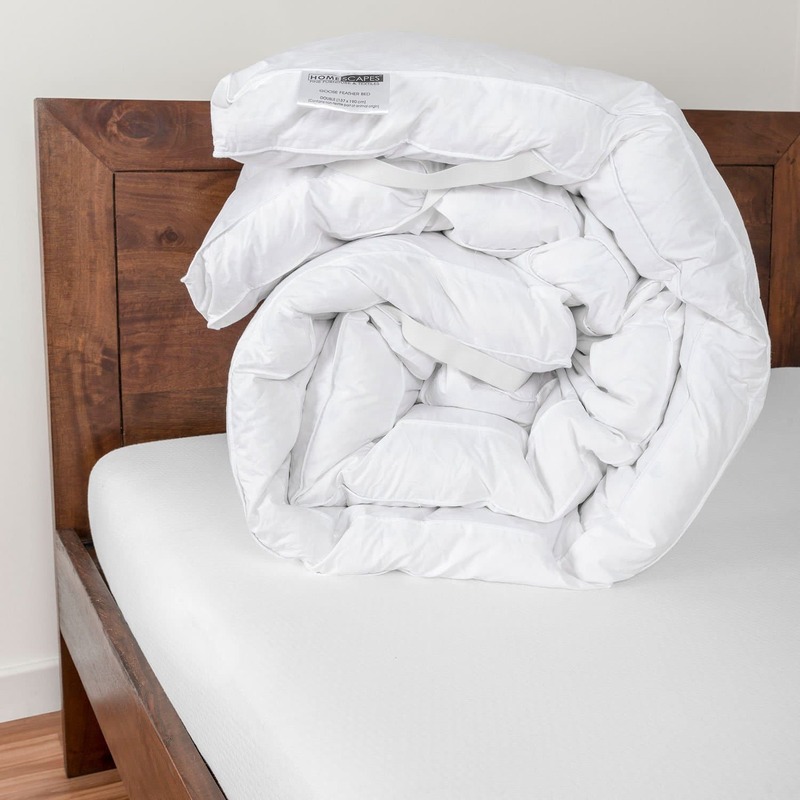 The TEMPUR Mattress topper 7 comes with an extra-soft jersey cover that you can remove and wash at temperatures of up to 60 degrees – great for making your topper last longer. Additionally, the cover has also been stringently tested to make sure it’s suitable for people with allergies. If you’re looking for peace of mind with your bed toppers, the TEMPUR also comes with a 15-year manufacturer’s guarantee, which is a lot more than most toppers offer. The memory foam is great at moulding to the shape of your body. 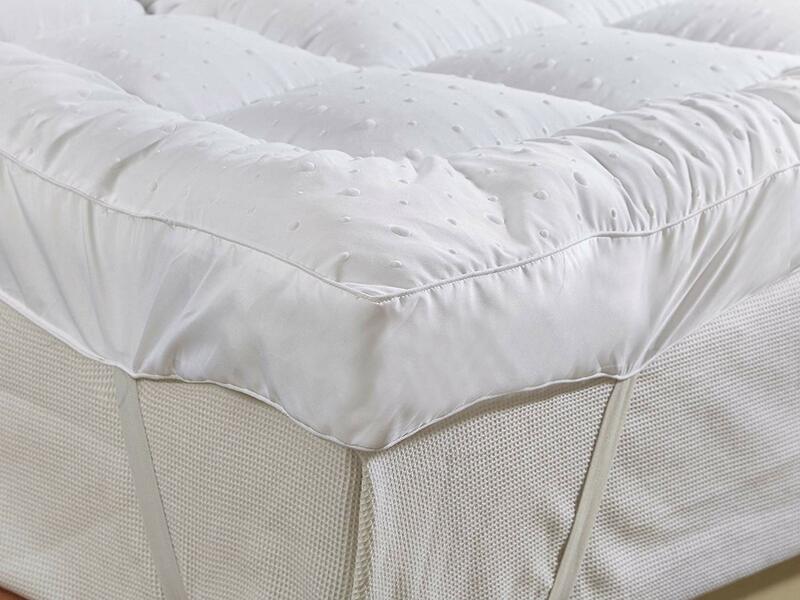 You may even find that you’re less likely to toss and turn at night with the TEMPUR to cradle you to sleep. Do you find that you usually get a better night’s sleep at a hotel than you do when you’re at home? This wonderful 4-inch deep mattress topper from Lancashire bedding could help you to recreate your most luxurious overnight vacations. Designed to transform any sleeping experience, this extra-thick topper is deep-filled to make you feel like you’re sinking into incredible comfort. Ideal for allergy sufferers, this is one of the best topper options if you have issues with synthetic materials. The cover is 100% cotton, and the extra-deep filling is also highly breathable, designed to eliminate allergens. The baffle walled cassette structure helps to keep the anti-allergy filling spread evenly throughout the topper night after night, so you don’t need to consistently pick it up and shake it out, unlike some other extra-thick toppers. What’s more, there are straps on every corner to help secure your new sleeping accessory into place. If a firm mattress topper doesn’t sound like your idea of the perfect night’s sleep, why not try something a little softer? The Bettersleep company hotel-quality super soft bed toppers are designed to give you a comforting and supple sleeping experience, through unique siliconised hollow-fiber fillings. Every pocket of your mattress topper is packed tight with padding, so you get a cosy night’s sleep, without having to worry about your topper going flat. This anti-allergenic mattress topper comes with a luxurious cover that you can machine wash at a temperature of up to 40 degrees. What’s more, the quilted box stitch construction means that your filling remains firmly in place, while the elasticated corner straps ensure that the topper itself doesn’t shift. If you’re looking for a topper without the bells and whistles of some more premium offerings, then this could be the ideal solution for you. The brand even claims that the cover is dust-mite resistant, to help protect allergy sufferers. When it comes to choosing the ideal mattress topper for your needs, allergy sufferers can often have a tougher decision to make than others. It’s difficult to find a topper that supports your sensitive skin – even if you choose something with a hypo-allergenic cover. Fortunately, microfiber fillings can help to eliminate some of the problems associated with an allergy-prone lifestyle. The Rejuvopedic mattress topper uses some of the most luxurious materials on the market to both protect your skin and senses, while giving you a more peaceful night of sleep. The premium 3D box structure also helps to provide additional sources of support where your body needs it most, so you can avoid problems with an achy neck or back. The unique covering on this model also comes with “3D massage bubbles” which gently soothe your muscles as you sleep – giving you a more restful night all around. Designed by a company that’s committed to excellent comfort, this memory foam mattress topper comes to you from the Sussex countryside and features high-quality memory foam throughout. Available in a range of sizes, and with or without an anti-allergy cover, these bed toppers may be the ideal choice for someone who wants something simple and effective for a night of better sleep. The memory foam in this mattress topper is firm enough to support the curvature of your spine correctly while you sleep, yet soft enough to make you feel comforted and relaxed whether you sleep on your back or your side. What’s more, the mattress topper is rolled when it’s packaged, which makes it much easier to place on your bed. At 4 inches thick, you can rest assured that this topper will eliminate almost any problems you might have with your old mattress. It may be the ideal solution if you have issues with your bed, but you can’t budget for a new mattress yet. The best mattress toppers will easily optimise and improve any mattress to suit your preferences. Many people use bed toppers to make their old beds more bearable. If you don’t fancy splashing out on a new mattress, a good bed topper (or pad) is a fantastic temporary solution to solve the problems of your old bed. At the same time, many mattress toppers can also come with additional features that you might not be able to find with a standard mattress. 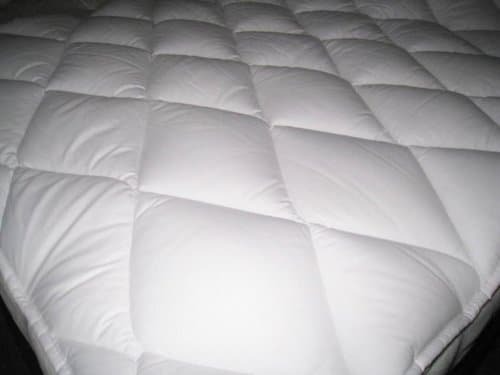 For instance, a cool mattress topper can help to eliminate night sweats and prevent restless sleep. So, how do you choose the right mattress topper? Before you begin browsing through the best bed toppers on the market, make sure you know what you’re searching for. It may be that you simply need something to make your bed more comfortable until you buy a new mattress. On the other hand, you might want a portable topper which you can take with you to hotels and guest rooms. If you’re looking for something portable, you’ll need a topper or pad that’s much thinner than if you were looking for the best mattress topper for bad back issues. Deciding exactly what you need in advance will help you to make a more informed decision. Memory foam: Memory foam is one of the most popular options for people in search of a firm mattress topper. Memory foam can support your body in all the right places, alleviating problems with painful joints, back pain and more. What’s more, if you sleep with a partner, a memory foam mattress won’t move with you, so that both people can enjoy a better night’s sleep. The biggest problem with memory foam bed toppers is that they can come with a strong chemical smell (VOC’s) when you first unwrap them. Down feather: Feather bed toppers feel similar to a feather cushion. They’re generally made from duck or goose feathers, and they’re designed for people who prefer a plush and very soft level of support from their mattress. These toppers can also be great for preventing you from tossing and turning during the night. Because feathers are quite breathable, they’re good when you’re looking for a cool mattress topper. However, you may find that you need to regularly shake the feathers out to avoid clumping. 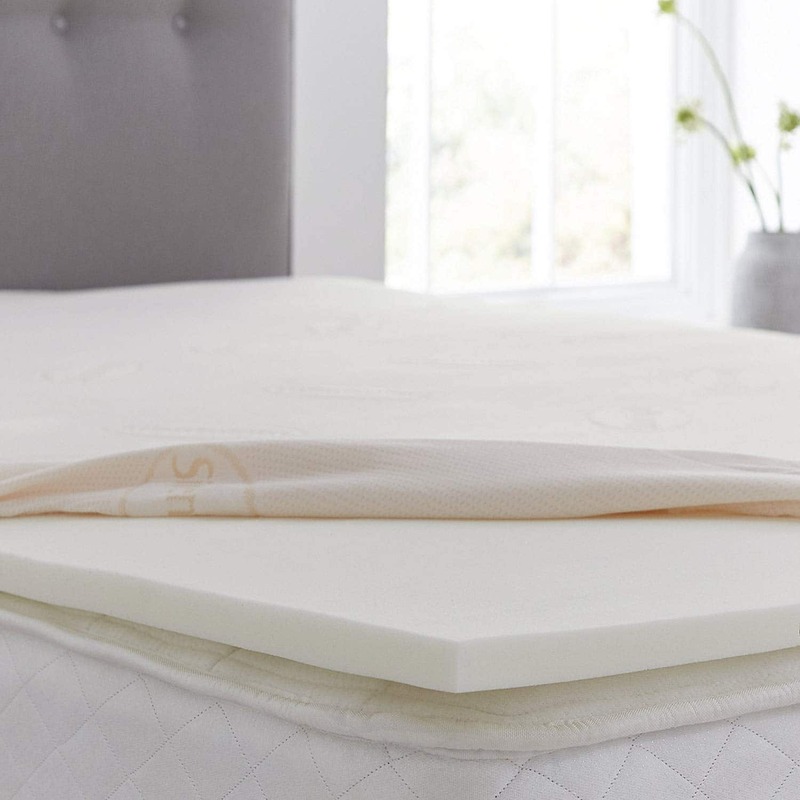 Natural fibre: Natural fibre bed toppers aren’t nearly as common as memory foam or polyester options, but they’re ideal for people with allergy issues. Made from wool, bamboo and other natural materials, these solutions are designed to keep dust mites and other allergy issues at bay. Certain natural fibres may be more difficult to clean than others. Make sure that you check the product description for machine washing options. Synthetic: Synthetic bed toppers are some of the most common and low-cost options on the market. These solutions come in a range of options when it comes to firmness and support. For the most part, however, synthetic toppers are usually quite thick, which make them a good choice if you have an old mattress you want to cover, or you’re looking for the best topper for bad back issues. Egg crate: Finally, these mattress toppers are defined by their egg-crate structure, which helps to break the filling up into segments. Most of these are relatively firm and comfortable, and they can often be thin enough to take with you if you’re traveling, however, egg crate toppers don’t have the springiness or resilience of some of the other types on the market today. Finally, don’t forget the finishing touches. One of the most essential elements you’ll need to get right with your bed toppers is the size. Unlike with duvets where you can “scale up” your sizing options, you’ll need to get the size exactly right for your mattress topper. Measure your mattress before you begin shopping. It’s also worth looking for a topper that has elastic bands on the corners to hold it to your bed – particularly if you’re a restless sleeper. If you plan on making your topper last, look for something you can clean easily, even if that means washing a removable cover. Finding the best mattress topper for your needs isn’t always easy. There are so many options on the market that it’s common to feel overwhelmed. The good news is that there’s something for everyone out there! 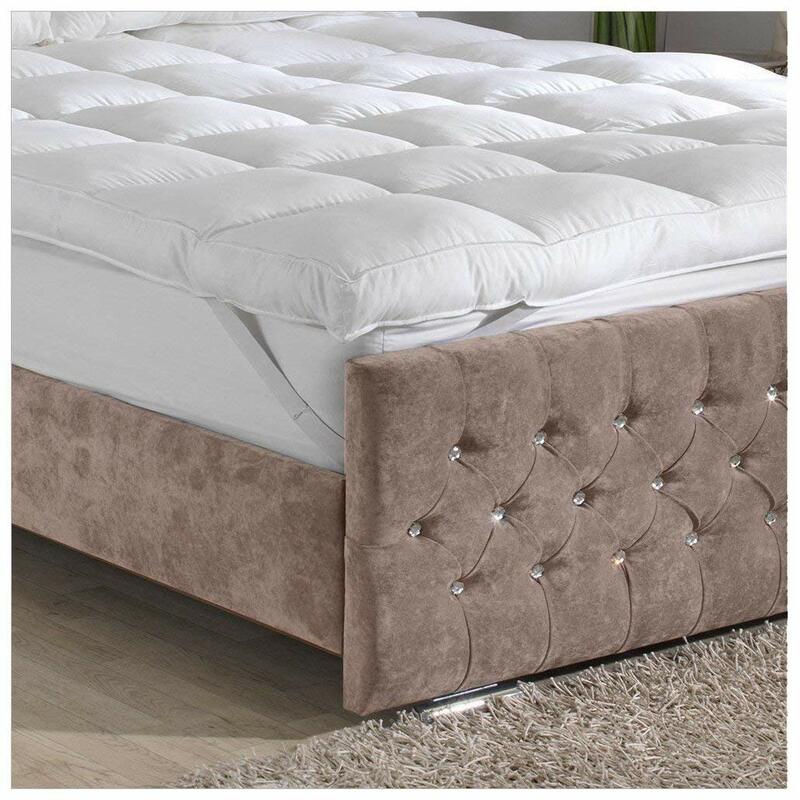 When it comes to absolute luxury, our favourite option is the Eve Memory Foam topper, with its fantastic foam structure and 30-day guarantee. However, you’re sure to find something on this list whether you’re looking for a cool mattress topper or something to aid your aching back. Good luck shopping, and sweet dreams!